This is a glossary of commonly used terms and abbreviations. I plan on updating and expanding it over time, so make sure to let me know if you think there’s anything missing. For ease of use, I split it into couple sections. I also grouped some related terms together instead of keeping the list 100% alphabetical. Hit Ctrl+F if you’re looking for a specific term. Gunpla: Official name for Bandai’s Gundam model kits. Also short for ‘Gundam plastic model’. Bandai: BANDAI NAMCO Holdings Inc., a Japanese toy company established in 1950. 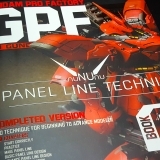 It has multiple divisions, but we usually refer to BANDAI Hobby, producer of Gunpla kits. P-Bandai: Premium Bandai, online store offering various limited edition products, including unique Gunpla kits. 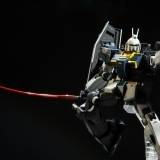 Since it only works in very few countries, P-Bandai kits usually have to be pre-ordered through intermediary. Most of those kits only get reissued once every couple of years, so it’s not uncommon for their aftermarket prices to rise greatly in between reprints. For example, MG Altron went for $150 on Amazon, over triple the original price, before announcement of 2017 reissue. Backlog: Kits that have been purchased, but are yet to be built. Bootleg: Unlicensed third-party kit, usually made in China. Bootlegs vary wildly in terms of quality and design. Some of them are horrible, straight-up copies, while others offer custom designs and decent quality. Build: Refers to the kit that’s either in progress or finished, or the process of building a kit. Custom: Kit that has been modified / customized in some way, be it by kitbashing, scratch building, applying custom paintjob etc. Kitbash: Using parts from multiple model kits on a single build. OOB (Out Of the Box, Straight Build): Either a kit that was snapped up, with no extra work done (no painting, panel lining, decals etc. ), or a kit painted in box/manual colors, with no further modifications. Snap-Fit: Kit that has been snapped up, with no extra work done. As opposed to OOB, this term is usually used to describe kits that we plan to paint or modify in the future. WIP: Short for Work In Progress. 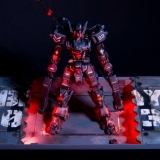 Dalong (Dalong.net): Gunpla builder and reviewer from Korea. His site features reviews (in Korean) and pictures of pretty much all modern Gunpla kits (minus P-Bandai), as well as quite a few older ones. Stickers: Most basic kind of decals, stickers require no extra effort to apply and come in two kinds. Foil stickers are printed on a silver backing and are mostly used for eyes, cameras and missing color applications. They come with pretty much all kits, but are most heavily utilized for missing color apps on HGs and SDs. Marking stickers are insignia, caution signs etc. printed on clear material. They can be distinguished by minty-turquoise backing. Overall though, stickers are disliked by modelers, as they’re thick and don’t blend well with the kit. Dry Transfer: Decals printed on the underside of a thin plastic sheet, with the ‘sticky’ side exposed. They’re applied by rubbing over them until they attach to a model. Dry transfers are best looking decals, due to complete lack of a carrier film around the design, which makes them much more believable than stickers and waterslides. Sadly, they are usually printed in a single color and are a nightmare to apply over curved surfaces, so their usefulness is limited. Waterslides: Main decals for serious modelers, they must be soaked in water to activate before application. Some auxiliary products can also be used to improve their look and fit on the model. Waterslide decals are usually aftermarket, as very few manufacturers include them with kits. Some companies, like HiQParts, sell generic caution marks matched to various scales. There are also those offering to print your own custom designs, like Samuel Decal. Diorama (Vignette): Three-dimensional model of a landscape, often depicting historical or fictional scene. A good diorama can greatly improve model kit presentation, adding some indirect storytelling and a sense of scale. Flash (Mold Lines): Thin layer of excess plastic on the parts, appearing where two halves of the mold don’t fit together perfectly. Usually noticeable on cheap kits and recasts. Flash is rare on modern, quality products. Frame Arms: One of the bigger lines of mecha kits produced by Kotobukiya, designed for easy kitbashing. M.S.G. line also features multiple optional weapon sets that fit onto Frame Arms out of the box. Frame Arm Girls: Kotobukiya’s line of tiny waifu kits, loosely based on various Frame Arms. Gate: Thin points on the runner where it connects with the parts. Gate is where you make the cut when removing kit pieces from the runner. Undergate: Gates placed on the inner edges of a piece, which are usually hidden from view. Greatly reduces the amount of nub removal work. Also great from chrome-plated pieces. Sadly, due to amount of extra engineering work required, undergating is still somewhat rare and usually employed only on more expensive kits. 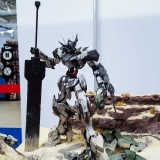 GBWC: Gunpla Builders World Cup, a yearly competition ran by Bandai. The biggest Gunpla building contest in the world. Grade: A specific Gunpla product line, like HG, RG, MG, PG, SD and so on. For more information, check out my Gunpla Grades article. Grunt Suit: Community term for mass production, front line mecha (a.k.a. cannon fodder). Inner Frame: “Skeleton” of a mecha kit, to which all the armor is attached. Usually present only on more expensive kits. Maschinen Krieger (Ma.K): Sci-Fi universe created by Kow Yokoyama in the 1980s. Many modeling companies produced Ma.K kits over the years and they’re still in print today. Mecha: Giant robots, designed for combat akin to tanks and fighter jets, often humanoid. Also Sci-Fi sub-genre focused on depicting such robots and their pilots. Mekki Plating (Mekki Chrome): Coat of colored chrome on the parts, sometimes used for swords on MG / PG kits, as well as limited Special Coating / Special Finish versions. Sadly, those special editions are usually not undergated, making nub management on colored chrome a nightmare. Nub: Leftover gate plastic that remains on the parts after cutting them off the runner. Must be removed by gradually slicing and sanding off excess plastic. Panel Lines: Recessed lines on the kit that simulate areas where armor plates meet. PlaMo: Short for plastic model. Polycaps: Joint parts (usually only female side) made of polyethylene, soft and slightly flexible plastic. Recast: Copy of a kit, figure, sculpture or parts thereof. Usually created using resin and molds based on the original, though small parts and miniatures can be cloned using Oyumaru and epoxy putty. Recasting is a gray area of the collectible hobbies, as unlicensed copies are illegal and buying / creating them is often shunned. Model builders often employ recasting in custom builds to speed up the process and avoid scratch building identical parts multiple times. Robot Damashii: “Robot Spirits”, a line of mecha action figures produced by Bandai. Runner (Tree, Sprue): Plastic “frame” that carries model kit parts. Scale: Factor describing relation between the model kit and source material, marked as 1/X. The smaller X is, the bigger the kit – basic math. For example: Barbatos Lupus is 19m tall in the anime, therefore 1/100 kit is ~19cm tall, while 1/144 is ~13,2cm tall. 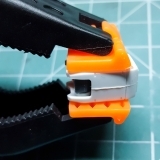 Seam Line: Gap where two halves of a section (that should ideally be a single piece, like gun barrels) connect. Mostly present on cheap / old kits. More advanced builders usually remove them using plastic cement and/or putty. Stress Marks: Discolored areas on the kit, where the plastic was stressed. Most commonly happens on pegs and joints due to rough handling of the kit and trying to bend limbs beyond their articulation limit. Putting further pressure on stressed parts will eventually lead to breaking them. Nub Marks: Stress marks remaining on the plastic after nub removal, usually due to cutting gates too close to the part. Unlike normal stress marks, nub marks don’t have much impact on structural integrity of the part. V-Fin: V-shaped antennas / horns present on most Gundams. Ver. 2.0 / Ver 3.0 / Ver. RM / Revive: Various suffixes used to differentiate newer, redesigned kits from older versions. Ver.Ka (Version Katoki): Unique versions of MG kits, whose production is overseen entirely by veteran mecha designer Hajime Katoki. See my Gunpla Grades article for details. Airbrush / AB: A tool for spraying paint, powered by compressed air. It allows for more creative freedom and better finish than painting using brushes or spray cans. Spray Gun: Oversized airbrush, allowing for much wider spray pattern and quickly covering big areas. Model building applications are limited, it’s more useful for painting cars, graffiti, furniture and so on. Compressor: Device used to compress and pump out air at a steady pressure. Best source of air for an airbrush. BluTack (Patafix): A reusable, plasticine-like material marketed mostly for hanging posters, pictures and so on. It also has a ton of modeling uses, like sticking parts on skewers before painting, test fitting etc. Conversion: A set of plastic or resin parts designed to turn a kit into another variant of the same model, or something completely different. Cutting Mat: Thin protective mat you can often see in the background of WIP pictures. Designed to protect desk from damage and extend the life of hobby knife blades. Detail Parts: Aftermarket parts (either plastic or metal) designed to add details to a model kit. Things like vents, rivets, verniers, handles and so on. Builder Parts: Line of detail parts for Gunpla produced by Bandai. M.S.G. : Popular line of detail parts and extra weapons from Kotobukiya. Designed with Frame Arms in mind, they go quite well with most Gunpla kits (though some of the weapons can look off). Photoetched Parts: Small metal parts created through a photochemical process, which allows for extreme amount of details. The downside is that they’re rather expensive, very delicate and require special tools to prepare them before placement on the model. FFA (Future Floor Acrylic): Clear acrylic floor wax, often used by modelers as cheap and durable gloss coat. It had its name changed many times over the years and it’s currently called Pledge Multi-Surface Floor Finish. 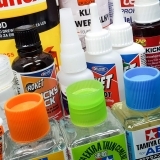 Glue: There are many different glue types useful in model building. Although Gunpla kits are snap-fit, glue still is quite useful for modifications and scratch building. CA Glue (Super Glue): Basic household instant glue, based on cyanoacrylate compounds. Can bond most surfaces and has uncanny ability to teleport onto your fingers. Plastic Cement: Glue, which only works on plastic (mostly polystyrene, but some also work on ABS). Rather than actually gluing two surfaces, cement chemically melts the plastic on contact, creating a very strong bond. Epoxy Glue: Two part glue based on epoxy resin, often sold in a double syringe. Once resin and hardener are mixed, it forms a third chemical that dries into extremely strong bond. It’s not used as often as other types, but it’s the best way to glue load-bearing parts. 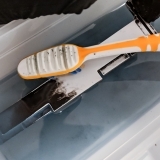 Epoxy adhesives can be fine-tuned for many different materials and various cure times (ranging from 5 minutes to over an hour), so make sure to check the label before buying. White Glue (PVA Glue, Elmer’s Glue): Polyvinyl acetate, great for bonding porous materials like wood, cloth and paper. Rarely useful for model kits, but it’s great for building dioramas. Often used in carpentry and book binding as well. Gundam Markers: Paint markers produced by GSI Creos. They come in a variety of types and colors, including fine tips for panel lining and standard marker tips for painting details. Gunpla Evolution Project (G.E.P. 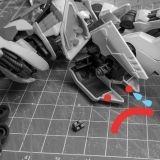 ): Project started by Bandai in 2017, intended to improve various aspects of Gunpla kits. Supposedly it’ll span all major grades and run until 40th anniversary in 2019. Hobby Knife (Craft Knife): Hobby knives consist of pen-shaped handle and exchangeable, razor sharp blades. Both come in various shapes and sizes, more expensive handles often include rubber grip for comfort, as well as a little stopper that prevents the knife from rolling off the desk and stabbing your floor/cat/foot. Isopropyl Alcohol (Isopropanol, Rubbing Alcohol): Often used as sanitizer and solvent, this alcohol is quite useful in model building. It’s good for cleaning a model kit before painting, as well as cleaning and stripping acrylic paint. Sometimes also used as acrylic thinner, makes paint dry faster (compared to thinning with water). 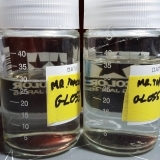 Usually sold as either 98% or 70% solution of isopropyl alcohol in water. Lightbox (Light Tent): A small box (usually between 30x30cm and 100x100cm) with walls made from light-diffusing material. Most of them can also accommodate a fabric or paper background. Along with some desk lamps it’s a rather cheap way of stepping up your Gunpla photography. Masking Tape: Tape used mostly for masking off parts of the kit during painting to achieve a color separation, paint a camouflage etc. Also useful for test fitting kits that require glue. Comes in two varieties – standard tape, usually yellow, as well as flexible one, good for masking around curves and doing hard-edged camo patterns. Model paints: Paints we use are formulated specifically for plastic model kits. Usual art store ones are rather poor alternative, as they’re designed for use on more absorbent surfaces, like paper or canvas. 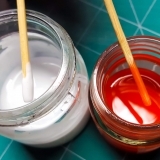 Acrylics: Non-toxic paints based on water-soluble acrylic resins. Only type of paints that’s safe to use without respirator and extra ventilation. They work well for both hand painting and airbrushing, but aren’t as durable as other types. Although they can all be thinned with water, acrylic thinners from the same brand will usually give better results. Examples: Citadel, Vallejo, AMMO, AK. Acrylic-Lacquers: Hybrid paints that can be thinned with water, acrylic thinner or, for extra durability, lacquer thinner. They airbrush really well, but hand painting them requires a lot of effort compared to standard acrylics, as acrylic-lacquers dry much faster. Examples: Tamiya Acrylics, Mr.Hobby H series. Enamels: Slow-drying oil paints, the first type of paint to be manufactured specifically for model building purposes. They use petroleum-based oils, so volatile spirits (white spirits, turpentine etc.) are used as thinner. As such they require good ventilation, preferably respirator as well. On the upside, they are excellent for hand painting and quite durable. Many weathering products are based on enamel paints, as they can be reactivated with thinner long after drying. Examples: Humbrol, Revell, Tamiya Enamels. Lacquers: Cellulose-based paints that turn everything to 11. Extremely toxic, highly flammable, will eat plastic if handled incorrectly, might kill you or your pets. Good ventilation, respirator and nitrate gloves are mandatory. In turn they offer amazing finish, best metallics on the market and highest durability out of all modeling paints. They are also quickest drying type of paints. Examples: Alclad II, Mr.Hobby C series (Mr.Color), Tamiya TS series, Mr.Paint. Oils: Traditional artist paints. Unlike enamels, they’re based on lineseed oil and are perfectly safe. Their modeling applications are mostly limited to weathering, though some miniature painters use them, since they can be blended very well. 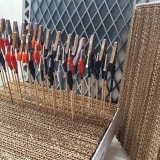 Before use they must be drained of oil for faster drying (otherwise it could take months) and less glossy finish. Abteilung 502 produces modeling oils that come in various weathering-ready colors and contain less lineseed oil than traditional ones. Examples: Abteilung 502, Winsor & Newton Artists Oil, Talens Rembrandt. Primer: Strong paint, usually lacquer (though there are acrylic and enamel primers), designed to prepare plastic for further painting. Priming parts allows other paints to adhere to the surface better, improving durability of the finished paintjob. Thinner: Liquid used for diluting the paints, actual substance varies depending on paint type. Retarder: Chemical agent that can be added to the thinned paint, extends the drying time. Nippers (Side Cutters): First tool every modeler should buy. Quality hobby nippers have thin, nearly flat blades, that give them precision needed to cut out even the tiniest parts without damaging them. Wire cutters are not an acceptable alternative. Oyumaru (Blue Stuff, Instant Mold): Rubbery plastic that can be easily reshaped once heated. Quick way to create molds for cloning small parts. Pigments: Base components of paints, responsible for the color. Also sold as a standalone product, often used to simulate mud, soil and rust deposits in weathering. Pipette: Lab / chemistry class equipment, very useful for measuring out custom paint mixes. Pin Vise: A small handle used for holding drill bits (usually between 0.1 and 3.2mm size). Plaplate: Polystyrene plastic, basic material for scratch building. Comes in sheets of various thickness, as well as pipes, rods and strips of many different shapes. Putty: High plasticity material, that cures and hardens when exposed to air. Often used as filler. Basic Putty / White Putty: Putty based on cellulose, commonly used for removing seam lines and filling minor surface defects. It tends to shrink a bit when curing, so it’s not ideal for filling large areas. Can be diluted with lacquer thinner if needed. Epoxy Putty (AB Putty): Two-part putty based on epoxide polymers. Great for filling large gaps, remodeling and scratch building. Once cured, it can be worked like model plastic, including drilling, sanding and sculpting. Light Curing Putty: Similar to basic putty, but it cures when exposed to UV light or direct sunlight. Can be tricky to use, though some modelers swear by it. Resin: There are many kinds of industrial resins, though we usually use the term to refer to polyurethane resin, material commonly used for recasts and garage kits. Respirator: Mask with air filters, protects you from toxic fumes when using enamel and lacquer paints. Scriber: A tool used for scribing panel lines. Term can be used for various tools, like actual scribers, blunt side of a hobby knife blade or a needle in a pin vise. Chisels: There are two kinds of modeling chisels – bigger ones, used for sculpting and reshaping, as well as tiny scribing chisels. The latter are used for creating panel lines/armor separation and usually come in sizes between 0.1mm and 1mm. Unlike other scribing tools, indents created with chisels are flat at the bottom, making them look more realistic. Dymo Tape: Thick plastic tape used by Dymo labelling machines, often used as a guide for scribing panel lines. Guide Tape: Plastic tape produced specifically to be used as scribing guide. It comes in various widths and tends to be cheaper than Dymo tape. Scribing Template: A sheet of thin metal with cutouts in various shapes, used as a guide for scribing. Comes useful when we want to achieve very specific shapes – circles, triangles, evenly spaced lines, hatches and so on. Spray Booth: Basically box with a strong fan and an exhaust pipe, designed to pull the harmful paint vapors outside. There are many commercial ones available, though usually its more cost effective to make your own. Top Coat: Final layer of paint on the kit, usually either clear acrylic or clear lacquer, used to protect all the work done (painting, decals, weathering etc.). Sometimes term is also used to describe any clear coat on the kit, including the ones used in between various stages. Clear Coat (Gloss Coat / Satin Coat / Matte Coat): Layer of clear paint used to seal and protect finished stages of the build, as well as to prepare surface for the next stage. For example, gloss coat over the finished paintjob will protect it and leave a good smooth surface for the decals to adhere to. Blending: Creating smooth transitions between colors, often involves using very thin paints. Masking: One of the paint prep stages, also known as stuff of nightmares / masking hell. Involves covering parts of the kit before painting to achieve a color separation, paint a camouflage etc. Mainly done using masking tape, though BluTack / Patafix, plastic wrap, masking fluid and putty are also common. Modding: Process of modifying a model kit – all forms of customization that alter shape of the kit. Reverse Wash: Technique of painting raised details that need to use different color than surrounding area, especially Gundam eyes, sleeves on Neo Zeon suits and so on. It involves laying down a color we want the raised details to be, then sealing it with clear coat, followed by layer of enamel paint. By wiping enamel paint off raised areas, we reveal the prepared color underneath. This technique is often preferable to masking complicated shapes. Scratch Building: Building parts of a model kit (or, in some cases, entire kit) from scratch. Basic scratch building materials are polystyrene sheets of various thickness and shapes, brass rods and epoxy putty. Scribing: Process of adding panel lines and other recessed details. Shading: Various techniques used for making paintjob more visually interesting (compared to basic uniform coat of paint). Pre-shading: Spraying a thin lines of dark paint (usually black or darker shade of base color) along the panel lines before laying down a base coat. It’s a long and tedious process and following paint layers have to be applied in very thin coats to avoid covering up the pre-shading. Post-shading: Almost exact opposite of pre-shading, it’s done after the base coat. Post-shading involves spraying a lighter shade of base color in the middle of panels. Less work intensive method of shading, but requires a bit more precision. It can also be paired with pre-shading for a more dramatic effect. Black Basing: Pre-shading flipped on its head. This technique involves starting from black primer (instead of more common gray one), then slowly building up irregular pattern of various colors. Once the pattern is in place, it’s blended together with semi-opaque layer of final color. Black Basing provides a degree of interesting tonal variety, while looking much less dramatic (and more realistic) than pre-shading. Modulation (Color Modulation): Painting technique used to achieve overblown, dramatic contrast and alter viewer’s volume perception. It involves individual shading on each panel, as if it had its own light source, separate from all other panels. Models painted using color modulation look rather unrealistic, though quite interesting visually. Spotlight: Painting technique used to simulate a single strong light source close to the model, with a very stark contrast between illuminated and dark areas. While it looks rather weird on a kit, it’s very impressive when model is placed in similarly painted diorama. Zenithal Lighting: Painting technique used to simulate a single overhead light source, with top of the model being highlighted and lower ones gradually getting darker. Weathering: Process of adding wear & tear to the model kit, using various products and techniques. Battle Damage: Simulating battle damage by actually damaging the kit – drilling holes, scratching plastic and so on. Often needs to be followed by some extra painting and heavy weathering or it’ll look out of place. Sometimes inexperienced modelers can go way overboard with damage, mutilating the kit with Dremel and soldering iron. Chipping: Weathering technique that simulates paint peeling off. It can involve painting chips on top of finished paintjob or creating actual chips using hairspray / chipping fluid. Drybrushing: Technique used mostly for highlighting raised details and weathering. Involves lightly brushing over the edges with nearly dry brush (hence the name), using a tiny amount of unthinned paint. Filter: Applying a layer of very thin paint over the model. Filters are used to subtly modify the colors of a paintjob to achieve various results. They can be used to mute overly vibrant colors or enhance the ones that are not vibrant enough. Adding blue filter to shadow areas and yellow one to areas that would catch sunlight can enhance realism, especially when paired with modulation. Usually done using oils or enamels. Panel Lining: Enhancing molded and scribed details on the kit, using either a mechanical pencil, fine tip marker or a wash.
Streaking: Weathering technique used to simulate streaks of grime: rust, oil, fuel, mud, rain marks and so on. Usually done by depositing small dots of paint and blending them downwards using a brush dipped in clean thinner. Wash: Using thin (though not as thin as filter) paint that’s darker than the base coat to add some depth to the details. 3M: Corporation best known for Scotch tape and Post-it notes. As far as our hobby goes, they produce high quality respirators and abrasives. AK Interactive: Spanish brand focused on paints, weathering products and modeling / painting guides. Although they offer wide range of quality products, some modelers accuse them of shady practices, like selling the same exact washes under many different names. Alclad II: Brand well known and liked for their excellent metallic lacquers. Superb quality and high shine make them paints of choice for many modelers looking to create natural metal finishes. Recently licensed to AMMO of Mig Jimenez, so their lineup got flooded with weathering products. AMMO of Mig Jimenez: Another Spanish brand, created by Mig Jimenez shortly after leaving / being ousted from AK Interactive (bunch of drama, stories vary). Most of AMMO’s catalog is virtually identical to that of AK, though recently they introduced some new products. AMMO is one of the first western brands to heavily promote mecha genre in modeling. 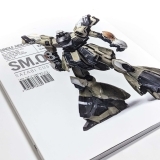 They offer a range of publications, products and video tutorials, showcasing traditional modeling techniques on Gunpla and other mecha. Badger: Badger Airbrush, American company producing good mid range airbrushes, compressors & various accessories. They also offer a range of paints. Bluefin Distribution: North American distributor for Gunpla, as well as some other Japanese brands. BMC: Sujibori Do’s brand of high quality hobby chisels & scrapers. Citadel: Brand producing quality acrylic paints, owned by Games Workshop. Used mostly by Warhammer 40k fans and other figure painters, it’s one of the best choices for hand painting. They also sell some insanely overpriced hobby tools. 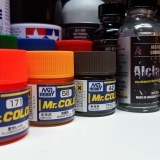 Deluxe Materials: UK Company manufacturing hobby supplies, including huge range of adhesives. Some of their products are pretty unique and worth a look. Dremel: Company best known for its high quality multi-purpose rotary tools, quickest way to turn your Gunpla into a pile of melted plastic. Games Workshop: British company, most known for manufacturing tabletop wargames, like Warhammer 40,000. Gaianotes: Japanese manufacturer, best known for their high quality lacquer paints. They also produce some other hobby supplies. Grex: American company producing, among other things, mid to high end airbrushes and compressors. GSI Creos: Formerly Gunze Sangyo. Japanese corporation focusing on textile materials, industrial products and nanotechnology. Owner of Mr.Hobby brand of modeling supplies. 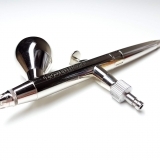 Harder & Steenbeck: German company, producer of mid to high end airbrushes of superb quality. Their most unique feature is quick and simple disassembly that requires no extra tools, greatly speeding up cleaning. Hasegawa: Japanese company producing model kits and high quality hobby tools. Hataka: Polish brand of paints. Their early products were rather horrible, but the formula has greatly improved since. 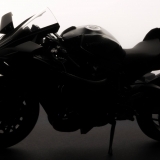 HiQParts: Japanese company manufacturing various detailing products, including metal parts, LEDs, photoetched parts, as well as high quality decals. Humbrol: UK company and one of the older names in the business, closing in on 100 years. Best known for their enamel paints, they also produce a range of rather decent hobby tools and supplies. Italeri: Italian company and another old name among western modelers. Producer of various model kits, die casts, paints and some basic tools. Iwata: Company started over 80 years ago in Japan. They’re all about airbrushing, manufacturing the widest range of products out of all the airbrush brands. Anything from cheap entry level stuff to top tier airbrushes and spray guns for professional artists. Kotobukiya: Japanese manufacturer of toys, figures and model kits, including various mecha lines like Frame Arms, Frame Arms Girls, Zoids and many more. Their M.S.G. 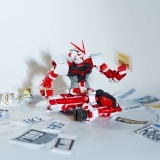 series (Modeling Support Goods) is of particular interest to custom mecha builders. Madworks: Taiwanese brand of hobby tools, best known for their excellent line of chisels. Unlike BMC, they come as standalone blade and can be easily mounted on most hobby knife handles. Master Airbrush: Brand owned by American company TCP Global. They mostly sell rebranded, low end airbrushing equipment made in China. While airbrushes themselves are rather poor quality, their cheap compressors are more than enough for most modeling applications. Microscale: American company focused on providing decals, stickers and metal signs for models and dioramas, including bulk orders custom prints. Also known for their finishing products, in particular Micro-Sol and Micro-Set decal setting solutions. MiG Productions: Company that produced some of the early weathering products. Nowadays they don’t have nearly as much market presence as other Spanish brands. They mainly offer pigments and 502 Abteilung oils. It’s also the first company Mig Jimenez started, before leaving due to disagreements (again, stories vary) and joining up with AK. Mr.Hobby: Japanese brand of high quality hobby supplies, owned by GSI Creos. They manufacture great hobby tools, paints and auxiliary products, as well as model kits. Also long-time business partner of Bandai, manufacturing a range of Gundam-branded hobby products, like Gundam Marker. Painting guides in Gunpla manuals always refer to Mr.Hobby paints. Mr.Paint: Manufacturer from Slovakia, producing very high quality lacquer paints. Considered superior to Mr.Color by some modelers. Despite the name, they are not affiliated with Mr.Hobby. Olfa: Japanese company producing superb cutting tools, including various hobby knives, scissors, saws and cutting mats. Tamiya’s hobby knives, saws etc. are actually rebranded Olfa products. Paashe: American company established in 1904, one of the oldest names in airbrush game. They produce a range of quality, mid to high end airbrushes, compressors and accesories. Pledge: Manufacturer of various cleaning products. Most importantly, Pledge Multi Surface Floor Finish (also known as Future or FFA) – clear gloss of choice for many modelers. Revell: German company, focused mainly on model kit production, though they also offer paints and some basic tools. Tamiya: One of the biggest name in the business, Tamiya is Japanese company manufacturing high quality model kits, paints, tools and supplies. Trumpeter: Chinese company producing model kits, tools and supplies, some of which are rebranded Wave products. They also sell hobby tools under Master Tools brand. Vallejo: Spanish company (although it first started in U.S.A.) that’s all about paint. Although they initially focused on fine art and decorative applications, company expanded into modeling and hobby sector in the 90’s. Since then, they became one of the biggest manufacturers of acrylic paints, catering to model builders and miniature painters alike. Wave: Wave Corporation, Japanese company producing model kits, option parts, figures and high quality tools. Winsor & Newton: UK company dating back to 1832, producing some of the finest art supplies available. They even supply Royal Family. Their handmade Series 7 Kolinsky Sable brushes are considered some of the finest among modelers. X-Acto: American company producing quality cutting tools, including a variety of craft / hobby knives. Brand of choice for many modelers. Amuro Ray: Main protagonist of the original Mobile Suit Gundam. Pilot of the original RX-78-2 Gundam. Char Aznable (Casval Rem Deikun): Ace pilot and one of the main characters of Mobile Suit Gundam and its sequels. Also known as Red Comet, always has his Mobile Suits painted red man salmon. Colony: Massive space stations, built to mimic Earth environments. In most Gundam timelines, there are billions of people living in those space habitats. Colony drops are one of the favorite weapons of mass destruction in most Gundam timelines. Earth Federation: Militaristic global government in Gundam series taking place in Universal Century. E.F.S.F. : Earth Federation Space Forces, a military branch. Gundam: Titular Mobile Suit, in most series it’s a one-off prototype, much more powerful than any other mecha at the time. Kira Jesus Yamato: Main protagonist of Gundam SEED, character composed primarily of plot armor. Mobile Suit (MS): Humanoid combat mecha, usually 17 to 20 meters tall. Mobile Armor: Non-humanoid combat mecha. Mobile Armors vary wildly between Gundam series. Sometimes they’re giant machines, sometimes common Sci-Fi fighters. Mobile Worker: Small mecha, mostly used for construction and utility, though there are some tank-like combat variations. Monoeye: Mecha designs using a single “eye” camera on the head, common in Zeon mecha. Newtypes: Next stage of human evolution, developed due to humanity’s migration into space. Newtypes posses enhanced reflexes, endurance, as well as some telepathic abilities (“able to understand each other without words” is the official explanation I believe). Coordinators: Newtype equivalent from Gundam SEED. Innovators: Newtype equivalent from Gundam 00. One Year War (OYW): Conflict between Earth Federation and Principality of Zeon depicted in the original 1979 Mobile Suit Gundam series. RX-78-2 (Granddaddy / Original Gundam): First Gundam ever designed, from the original anime series back in 1979. Zaku: Original grunt suit design from 1979 Mobile Suit Gundam. Zeon: Republic of Zeon / Principality of Zeon – space nation in Universal Century timeline, waging independence war against Earth Federation. Heavily based on Nazi Germany. Neo Zeon: Second incarnation of Zeon. Timeline: Alternative version of history / alternative universe. Most Gundam series are set in their own unique timelines. They are mostly unrelated, though some events might be similar. All timelines, except for Build Fighters, converge in Correct Century. Advanced Generation (AG): Gundam AGE timeline, couple hundred years after humanity colonized space. AGE series starts in AG 115. After Colony (AC): Timeline used by Gundam Wing (starts AC 195) and Gundam Wing Endless Waltz (AC 196), counted since construction of first space colony started. Mars Century (MC): Era existing alongside and after AC, used in Gundam Wing: Frozen Teardrop novel. It’s counted since the colonization of Mars in AC 182. After War (AW): Timeline used in After War Gundam X series (starting AW 15). This era starts with a massive colony drop killing 99% of Earth’s population. Anno Domini (AD): Timeline Gundam 00 series is set in, the only series so far placed in our era. Although anime starts in AD 2307, plot events go all the way back to year 2051. Build Fighters (BF): Timeline of Gundam Build Fighter series. Unlike other timelines, no dates are specified. Due to many cameos of characters from other Gundam series (or based on such), it’s sometimes considered to be “Gundam Valhalla” or “Gundam Heaven”. Correct Century (CC): Turn A Gundam timeline (starting CC 2345) and common future / culmination of all other Gundam timelines (excluding Build Fighers). Cosmic Era (CE): Timeline used by Gundam SEED (CE 70), Gundam SEED Destiny (CE 73) and their side-stories. Future Century (FC): Mobile Fighter G Gundam timeline. Series starts in year FC 60. Post Disaster (PD): Timeline used in Iron-Blooded Orphans series. Counted since the end of Calamity War, humanity’s conflict against autonomous mecha called Mobile Armors. IBO events start in year PD 323. Universal Century (UC): Main and most developed timeline of Gundam franchise. Used by the original Mobile Suit Gundam series (UC 0079) from 1979, as well as all of its sequels and side-stories, including Zeta (UC 0087), ZZ (UC 0088), Char’s Counterattack (UC 0093), Unicorn (UC 0096), F91 (UC 0123) and Victory (UC 0153). There are also two alternative versions of UC timeline – the ones used in Gundam The Origin and Gundam Thunderbolt. Differences are very minor though. Regild Century (RC): An era following Universal Century, set thousands of years after original Mobile Suit Gundam series. So far the only series set in it is Gundam Reconguista in G, starting in RD 1014. Well, there we go. I’ll try to keep updating and expanding this glossary over time. If you think of something that should be included, feel free to drop a comment below or on my Facebook page.